We have designed Twenity to be as intuitive as possible. Based on the initial impressions of our players, we've done a pretty good job. But a few words concerning the two major elements of our service won't hurt, so everybody will be able to understand how the concept behind Twenity works. A game that helps you discover your social capital while competing with your friends. Twenity started off as a plain calculation, which determines your social capital (we will be revealing how it works in some other post). At that time, it was called Twitfluence. But we knew this wasn't enough, so we've begun flirting with gamification, trying to bring gaming mechanics to the scoring. This lead us to designing a real-life adventure that contains challenges, levels and achievements (badges). The score you receive on Twenity is fully independent from the adventure. It is not influenced by your level, badges or any other things in the game, it is calculated purely on your Twitter activity (followers, tweets, lists). On the other hand, the adventure part (levels and badges) is sometimes dependent on the score. While some badges are rewarded for different Twitter achievements (number of followers, retweets, etc. 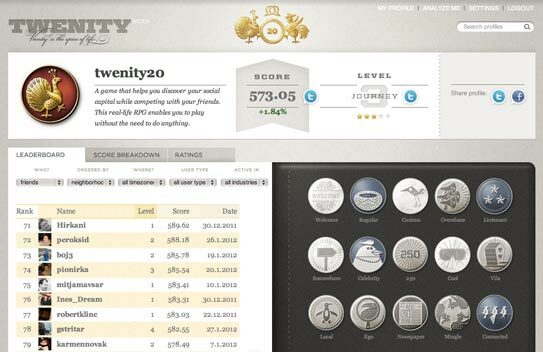 ), others are unlocked with Twenity activity and information (days on Twenity, the score you receive, etc.). Even though Twenity is a game first, social influence measurement tool second, the score is its core, and the gaming part is wrapped around it. You need to have a stable foundation for advanced features, and the calculation provides just that. But it's the adventure part that makes is so much fun and different.